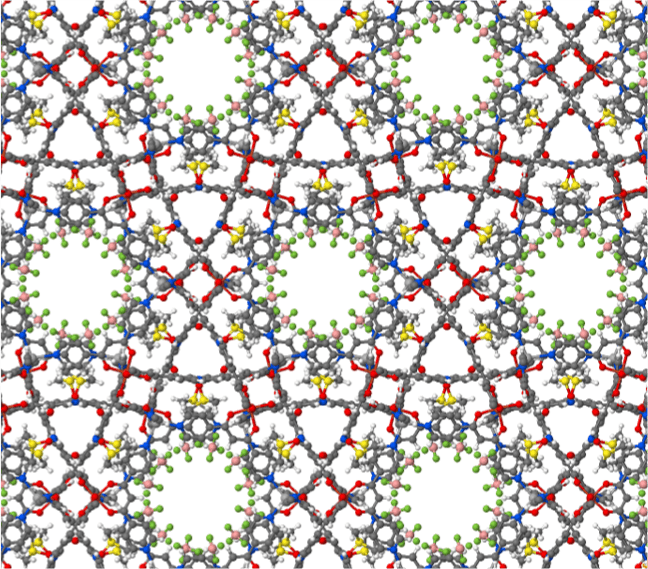 [AgFe(dppd)3]BF4·2DMSO·2H2O is a mixed metal MOF (metal organic framework). It is made up of and nodes with dppd (1,3-di(4-pyridyl)propane-1,3-dionato) , and has dimethyl sulphoxide (DMSO) and water solvent molecules inside it. Iron is octahedrally coordinated to three dppd linkers through the oxygen atoms, and each Fe(dppd)3 unit is coordinated to four silver atoms through the pyridyl nitrogen atoms.